Apple Tree Pre-School was established in year 2000 and we are affiliated with Bina Bangsa School which enables children to have direct entry once they have completed their preschools. We have adopted Singaporean Curriculum for our pre school programs. Through great demands, hard work and dedication of the participating members of Apple Tree, the program's popularity made it necessary to expand to greater areas. As a result, Apple Tree is excited with the opportunity to offer its programs to children across Indonesia, starting in Jakarta. Apple Tree believes that the early years of a child's life (birth - age 8) are the time when children are building a knowledge base they will draw from throughout their lives. It is during this time that the brain is developing most rapidly, making early experiences critical to every child's social, emotional, physical and intellectual development. This is part of the reason why we are using English as our primary language and teaching Mandarin everyday, because children are capable to learn more than three languages at the same time. The classrooms in Apple Tree Preschool provide safe and healthy environments with careful supervision. The daily schedule is organized to allow for active and quiet activities. Extended periods of time are provided for play and the use of materials that build on the child's natural curiosity and interests. Learning activities are closely linked to the child's own life experiences, with the opportunity to choose from a variety of activities and materials that are offered to provide appropriate challenges for each child. Teachers engage in meaningful conversations throughout the days that help the children to extend thinking, develop communication skills, increase vocabulary and become aware of step by step problem solving. Teachers support and guide children's participation in play activities to maintain social, physical and intellectual development. Apple Tree is also proud to have created our own "Apple Town". In there, games and materials are offered to challenge the children to extend their thinking and engage exploration, which is interesting and unique. Materials are rotated on a regular basis to maintain high interest and use. As play is the work of the child and how a child learns about the world, each section in "Apple Town" provides specific learning opportunities. JOIN US TO BE PART OF US ! • Apple Tree Pre-school has been recognize as a well establish pre-school with an experience of 11 ( eleven ) years track record in early childhood programs. • A trusted Pre-school to educate young learners to perform well academically through experiential learning. • More than 1.000 + children around Indonesia. 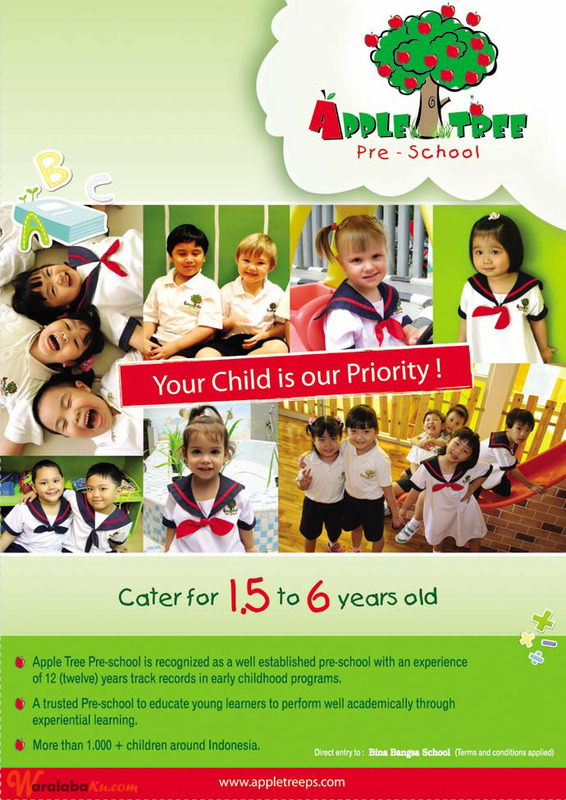 Tertarik dengan franchise Apple Tree Pre-school?